It's clear that Instagram isn't just a social network for posting cool views with filters or the odd selfie anymore. Instagram now has a whopping 700 million monthly active users and has evolved into a platform that can visually represent a brand. There are some brands out there that are doing really well on Instagram and we wanted to see why they are so successful. Use these 6 brands to help inform your own Instagram strategy and hopefully inspire you. A obvious brand to start with is Adidas. With over 15 million followers they have a very high influence within Instagram. They use their Instagram account to generate awareness of the brand and their range of products. 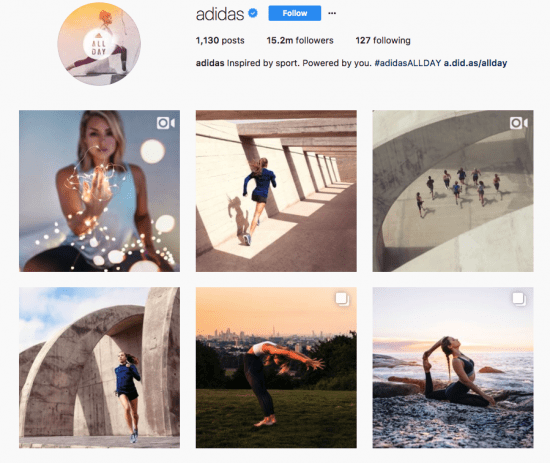 They do this by sharing visual content and videos to drive more enthusiasm for Adidas products. Every image includes an adidas product, compared to the other accounts mentioned in this blog this is this most sales focused account. You may have noticed that most of their images feature women. This isn't chance, it is a smart tactic, because 68% of Instagram users are female. What can we learn from Adidas? Look at how you can photograph and visually share your product in an engaging way. Get creative and consider using a range of methods first to see what works best. Consider using a professional camera instead of a standard iphone shot; helping your make photos stand out. Also, if you're a brand that appeals to both males and females, look at how much of your content appeals to a female audience as this could work in your favor. Airbnb is a trusted community for people to list, discover and book unique accommodations around the world. They use Instagram to visually encourage their followers to find out more about their services and to explore and travel more. What they do well is sell an experience they use user generated photos and the caption to paint a story behind each photo. In a recent campaign, Airbnb took to Instagram to show their full support for acceptance of people from different places and backgrounds. They based the campaign around the popular hashtag #WeAccept. This campaign received a mass of engagement and were one of the few brands expressing their political views on a very topical global issue at the time. If you are looking for a ways to differentiate yourself on Instagram consider tapping into topical issues in creative ways on topics that matter to your following. One way they win over followers is with their beautifully crafted captions. Capture your followers attention with a beautiful picture and tie it into some brilliant storytelling. Unlike Twitter with a limited word count you can have up to 2,000 characters on Instagram, make every character count. GoPro's account is by far one of the more exciting accounts you could follow. User generated content has been the key to their Instagram success. They don't just use the platform to sell their products but to sell a lifestyle of adventure. If you look through their photos you will find it hard to find photos of just their products. They have two contests running each day 'Photo of the day' and 'Video of the day'. The winners get their content shared and GoPro give credit to the user. Photo of the Day: During a transatlantic journey from #France, @chrisgmorris2 noticed a hitchhiker #surfing the bow #wave of his #boat. He resourcefully snagged a washing pole and mounted a #GoPro to the end. With the camera set to TimeLapse mode, he leaned out of the fairlead to get close to the #action. • • • @GoProFR #GoProFR #? #? What can we learn from GoPro? Go beyond just selling your service or product. Give meaning and purpose to each post and find what your followers are most passionate about. Consider using a contest or competition to encourage your followers to share photos, similar to how GoPro have. They also use relevant hashtags to increase their posts visibility. consider using 5-10 hashtags per posts to increase the visibility of your posts. You can also use existing hashtags that work across various industries, for example, #TBT or #MotivationMonday. ASOS has a following of around 6 million people. Their Instagram strategy is quite different to other retailers. Firstly they have a main Instagram account sharing offers, new collections and lifestyle content. They also have a 'ASOS as seen on me' account. This profile is solely devoted to sharing photos of other instagramers wearing their clothes. Users just need to tag them in a photo and ASOS will share the photo with the code to the items of clothing. This is a very clever selling tactic, as it allows followers to see their clothes on real people and give them a opportunity to find the clothes. The third way they they use Instagram is through partnering with influencers to create sponsored posts. But instead of posting the sponsored content on their personal profiles they go one step further and create “sponsored accounts”. Influencers such as @asos_ashley and @asos_Georgia use these account to primarily feature ASOS clothing. 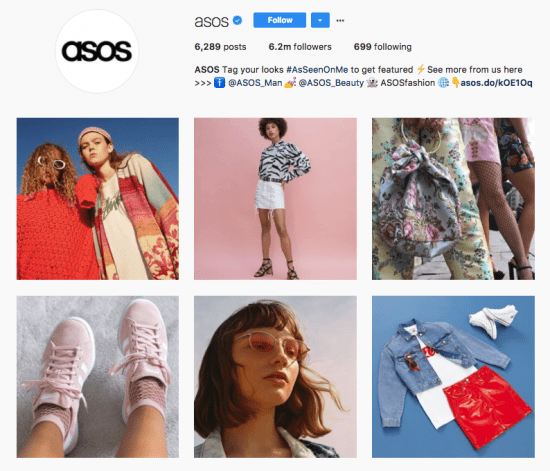 What can we learn from ASOS? Look to who is influential in your industry and try to work along side or with them to promote your brand. Look at ways of getting people to share their experience using your product or service. Joe Wicks is one of the many fitness and lifestyle influencers who has turned a Instagram account into a business. Originally a personal trainer he started posting short and snappy Instagram videos of how to make healthy meals. This resulted in him launching three books based on these recipes called 'Lean in 15'. In just three years he has used Instagram to sell his books and build a community of 1.9million followers. He also shares transformation photos of people using his recipes and workouts. Showing the results of using his book and routines. What can we learn from The Bodycoach? If your business has any success stories look at ways of sharing them across Instagram, whether that's using video, quotes or visual results. That way you have real people giving real reviews of your product. Another lesson we can learn from joe wicks is he started the recipe demonsatration craze on Instagram, so dont be afraid to try new, creative ideas to sell yourself. Sometimes it pays off to be different. 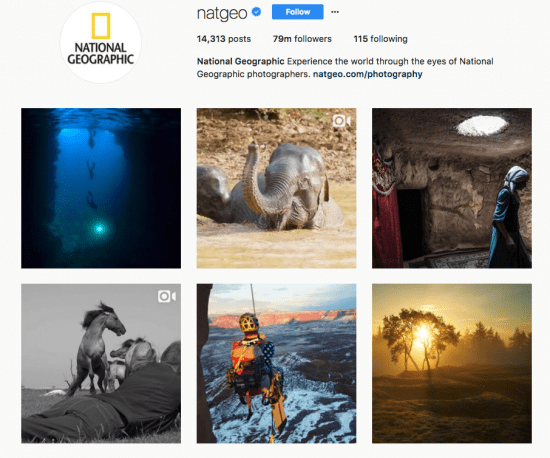 National Geographic is known for its stunning photography, so a visual platform such as Instagram is perfect for them. With 79million followers, it is clear they are doing something right. With each beautiful image, they have a detailed caption explaining exactly what is in the photo and what its purpose is. The refreshing thing about National Geographic is they are not trying to sell something or copy anyone else. They are just sharing talented work and talking about things are passionate about. What can we learn from National Geographic? Sometimes it's not about selling and pushing your product out as much as you can. Its can have more impact by being true to the brand and sharing things you are good at and passionate about. If you are a brand that is solely about imagery Instagram is the perfect social media platform for you, as photos get 2 times more engagement than any other platform. Whether it’s through influencer marketing, unique and captivating video, or by leveraging current events, each of these campaigns is an excellent example of the potential of Instagram marketing. If you have any other awesome Instagram marketing examples please share them with us by commenting below or tweet us.